Control the cowl! 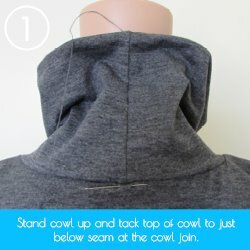 A quick tack to keep your cowl in place. to Issue 7. Jessica is sharing with us a way to keep the cowl on your Jukebox Rhythm Version looking its best! 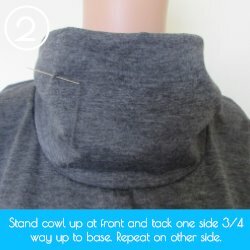 Stand cowl up and tack top of cowl to just below seam at the cowl join. Stand cowl up at front and tack one side 3/4 way up to base. Repeat on the other side. 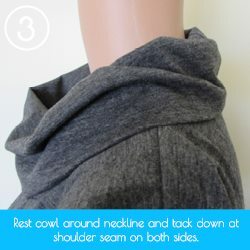 Rest cowl, around neckline and tack down at shoulder seam on both sides. 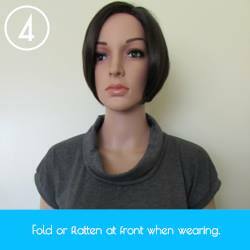 Fold or flatten at front when wearing. We’re having our first #Love2SewOT Competition between now & 8th July. It’s a great excuse to try something new, have some fun and sew up your One Thimble patterns! there’s plenty of reasons to come sew with us! from any issue of One Thimble Digital Sewing Magazine as inspiration. You can choose from the same issue or from two different issues. You can mash the patterns, adapt them or use them straight. You can even use more than two patterns/articles if you’re feeling super keen! Twist shift from Issue 2 with handmade bias binding using the instructions included in Issue 7. Urbanite Pants from Issue 4 with Traveller Tee from Issue 4. 2. Send a photograph of your finished project and a brief description of your project (including what patterns/articles you used, from which issue and the story behind your project) to hello@onethimble.com.au before 6pm AEST 8th July 2015. 3. Entries will be added to an album on the One Thimble Facebook page & shared on the One Thimble Blog. You can share your finished project on instagram/facebook using the #Love2SewOT (optional). 4. BONUS: WORK IN PROGRESS COMPETITION. Post a picture of your work in progress on instagram or facebook using the #Love2SewOTWIP before 24th June 2015 to enter. 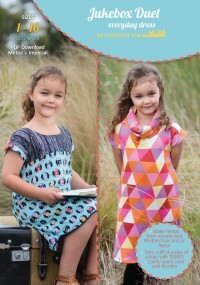 Criteria: Most original or unexpected use of the patterns/articles from One Thimble Digital Sewing Magazine. Criteria: Not necessarily the most accomplished project but the one with the most inspiring story. Criteria: The project that best reflects One Thimble’s aims. Your project must be sewn by you between 10th June and 8th July 2015 using two articles/patterns included in One Thimble Digital Sewing Magazine Issue 1-7 as inspiration. By entering you agree that the picture of your project may be shared as part of the promotion for the competition (feel free to watermark your entry). 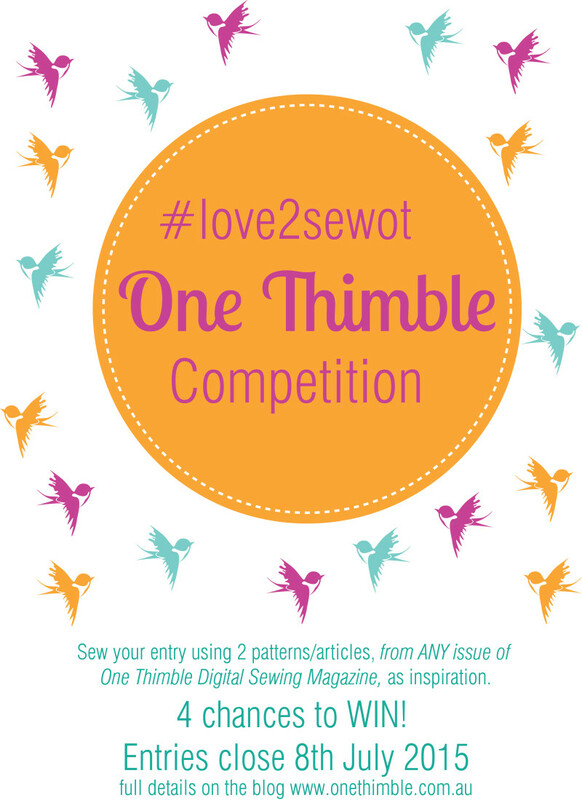 You may enter as many times as you like but each entry must be for a new project and must use two articles/patterns included in One Thimble Issue 1-7 as inspiration. Chance plays no part in the competition – entering more than once does not increase your odds of winning. Winners will be chosen by the judging panel (Jen Kennedy, Alison Hally and Elaine Brown) using the criteria detailed above. Winning entrants will be notified via email to the email address their entry came through from on the 15th July 2015. Except for the #Love2SewOTWIP winner who will be contacted via their social media account on the 26th June 2015. Winning entrants must reply within 72 hours in order to accept their prize or new winners will be chosen. Entry is open to Australian and International participants over 18 years. I first “met” Jess when she entered her Sneak Peek Sweet Treat Stocking into our Fat Quarter Competition last year. I was so pleased when she agreed to contribute her Jukebox Duet Pattern to Issue 7. 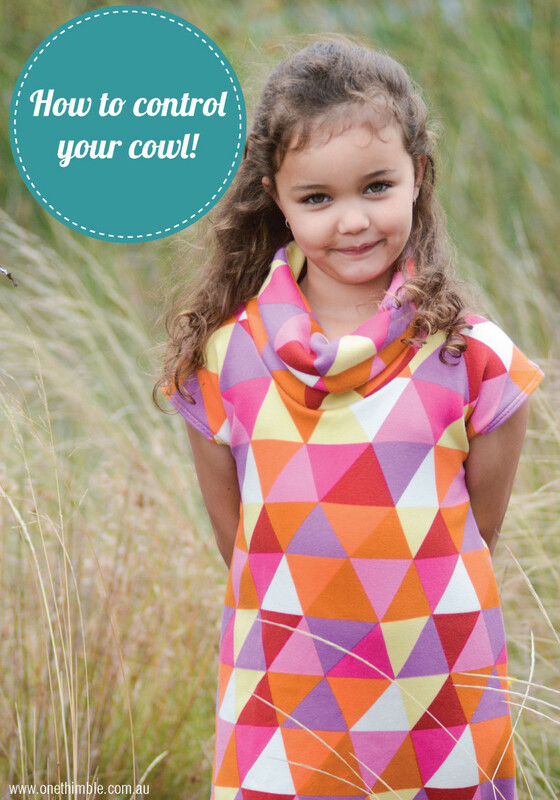 This is one of the most versatile patterns we’ve ever included in One Thimble! It all started with compulsory high school textiles class…. They gave us a term to make a pair of board shorts. One week later I wore my new (Self designed) shorts to class and asked what I could do for the remaining 9 weeks? I was pointed toward the remnants bin and let loose my creativity! Like a lot of new mums I got back into sewing when I had my first baby. It all spiralled! from there! My favourite tip is ‘lift your foot’ it applies to the presser foot and the pedal! The best way to get tidy stitching around curves is to sew a few stitches, lift the presser foot, realign the fabric a smidge, then put the foot down and sew a few more – rinse and repeat! As for the pedal – too many people sew at speed – many new machines have a throttle restrictor slide that can help lead feet from costing you unnecessary time with the dreaded unpicker! Inspiration is always coming from where you least expect. A glance at a passer-by’s pretty bag, a torn t-short that gets you wondering what you could make with the fabric, a random request from a friends child or just necessity. My favourite pattern is the Super Suit Set. I only wish I’d made it before I had 4 babies! It was only recently published and my youngest will outgrown the pattern by the end of the year. 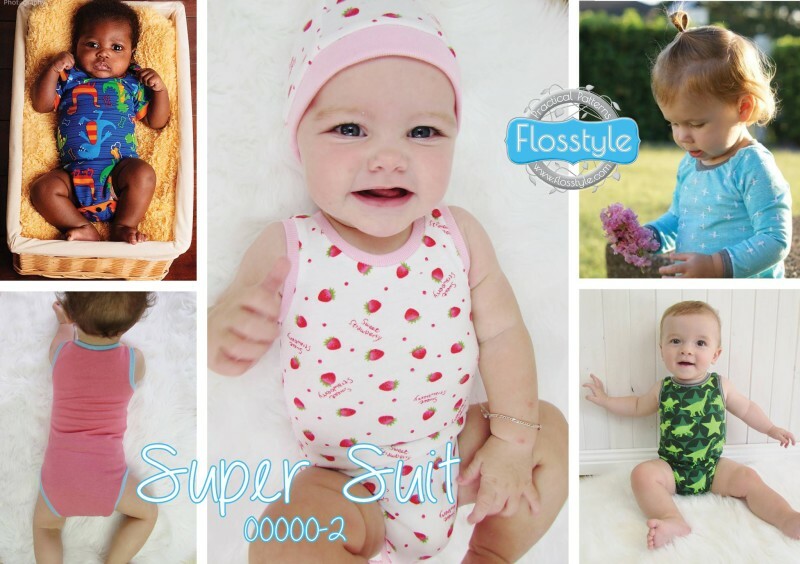 I always loved snap singlet suits for all of my babies but couldn’t justify the extra cost so they only had a few in each size. Now I can make them in every size for a fraction of the cost in much more fun prints, but alas I don’t need them! The Super Suit PDF Pattern is available HERE. I do keep to myself a bit but get a lot of queries about my kids as they model in a lot of my photos. So, for those who have been wondering My kiddo’s are Zac (the tallest skinny man with curly hair), Wyatt (the stocky lad with straight hair, ‘Flossy’ Miss Ivy Jean my only girl with golden ringlets and my baby budda Master Cody. I do love hearing the names that often accompany photos from sewers of their little people in their Flosstyle handmade so I guess it’s only fair I share too! The most challenging part of many sewing Mum’s day is their own conscience! You often feel guilty sewing or tracing off patterns with a little grub tugging your ankle for attention. How I time manage is to let Grub help you pack clothes in the washing machine and pickup toys to get your housework done when they are awake and they can learn valuable life skills along the way, save nap time for cutting out as its not noisy and once the kids are tucked into bed at night, switch the TV off and get sewing! Trying to sew with awake kids is stressful and not conducive to a productive afternoon. Just wait till morning to get a good photo of your hard work in natural sunlight! 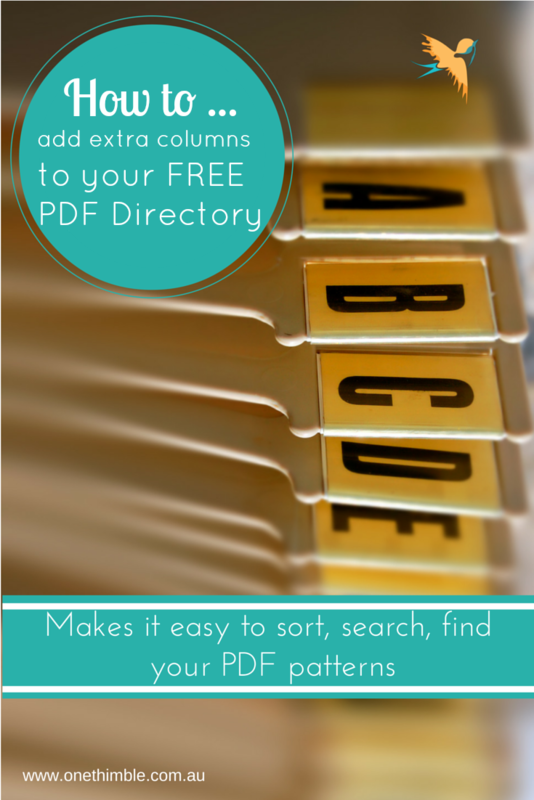 The Free PDF Pattern Directory which Nerissa from Spreadsheet Geek made for us has been a big hit! Thankyou! I’ve really loved seeing you share it with your friends and let us know what you thought about it! If you missed it you can read the post and download your free copy HERE. We’ve had some queries as to how to add extra sortable columns to the spreadsheet (eg if you’d like to be able to sort your patterns by fabric type etc.) so Nerissa has done us up another blog post explaining how to do this. I had a little play this morning using her instructions and added the fabric type column people had been requesting and pre-loaded this version with all the One Thimble patterns from Issue 1-7. If you’d like to know how to add extra sortable columns to the spreadsheet read on! Right click new button, and select Assign Macro. Select a macro and click Edit. It doesn’t matter which one you choose at this stage, this is just an easy way to get into the Visual Basic. Save your work – click the disc icon near the top left of the screen. Close this Visual Basic window. ‘sort patterns by name, then designer This is not actually code, but a comment differentiated by the ‘ (apostrophe) before the text. When coding, it helps commentate the code at a first glance. B4:B2000 In the OT pattern directory, columns are first sorted by column ‘x’ then column ‘y’. 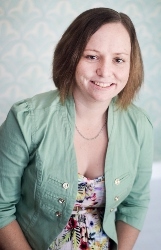 In this code, the macro sorts column B first, then column C.
Today we have a very special guest on the blog – Stacey who blogs at From-a-box. She tested the Everest Pants and joined us on the One Thimble Issue 7 blog tour. I was so impressed with her version of the Everest Pants that I asked her to join us and walk us through how she added the extra pockets! Need more pockets on your Everest Pants? Want your pockets to fasten closed? Make them into cargo pants! The Everest Pants is a PDF Pattern designed by Jess at Gracious Threads. The fully lined pants can be made in all kinds of fabrics. Make athletic pants with a mesh lining, snow pants from water proof nylon, and casual pants from twill or corduroy. HERE I stitched up a pants in khaki twill fabric, and HERE I stitched up pants in camouflage board short fabric enhanced with side pockets! The pants are already super stylish with pockets, paneled front legs, articulated knees, and detailed top-stitching. And to make them even more awesome, here is how you can add side pockets for a cargo style. Cut 2 pockets for the sides using pattern piece #8. Finish the side pockets following the instructions for the back pockets. Now you have 4 finished pocket pieces – 2 for the back pockets and 2 for the side pockets. On the wrong side of the back pocket, mark the center and down 3/8” on each back pocket piece. Place the rough side of the hook & loop square on the mark. Stitch close to the edges around the 4 sides of the hook & loop square. Repeat for each of the other pocket pieces. Mark the center and down 3/8” from the marking found on pattern piece #2 (back). Place the smooth side of the hook & loop square centered on the mark. Stitch close to the edges around the 4 sides of the hook & loop square. Repeat for the other back pocket. Find the location for the side pocket. You want the side pocket to be centered vertically between the bottom of the front pocket and the first dart, and centered horizontally on the center of the side seam. Mark the outside edges of the side pocket on the pants. Then mark from the side seam center down 3/8”. Place the smooth side of the hook & loop square centered on the mark. Stitch close to the edges around the 4 sides of the hook & loop square. Repeat for the other side pocket. Following the same method as the back pockets, stitch the side pockets. The hook & loop closures should align. Now you have side pockets and your pockets stay closed, making these Everest Pants cargo-style! 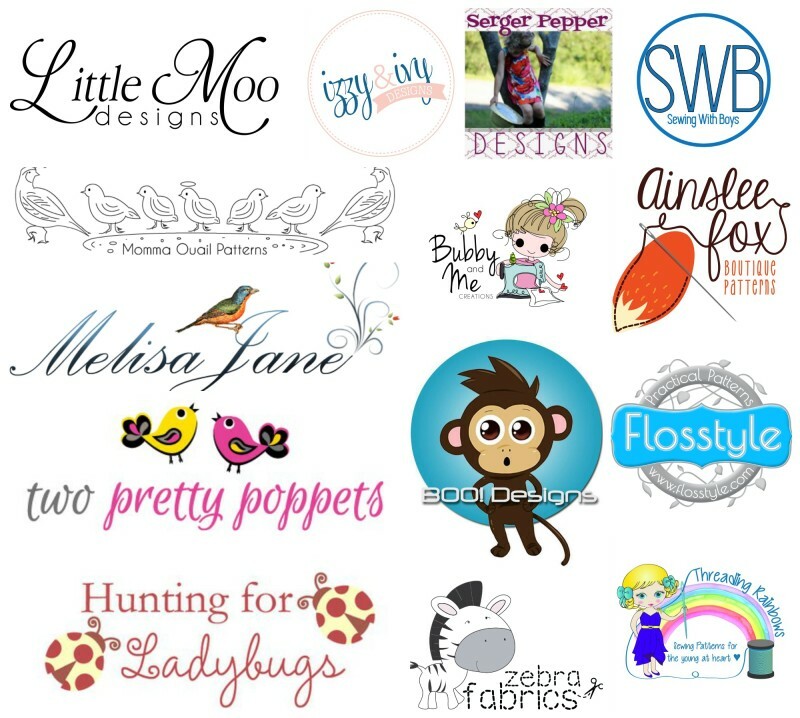 If you would like to see more of my stitched up goodies, visit me at From-a-Box where I blog about the clothes, bags, and some home decor made for my family and friends. There is also some cooking, and occasional family adventures. Hope you enjoy and find some inspiration!